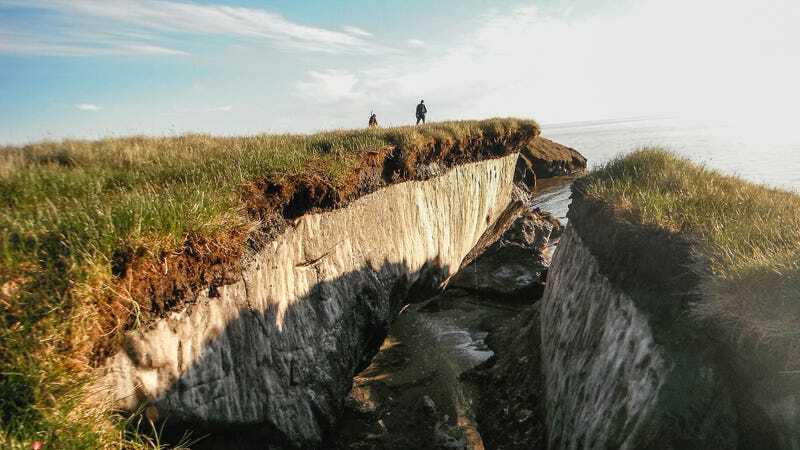 Thawing permafrost is creating major problems for Alaskan communities, and the situation is poised to get worse as temperatures keep rising. Now scientists have pinpointed a new reason to be concerned about ancient soils coming out of the freezer for the first time in millennia: mercury. Lots and lots of it. A study published Monday in Geophysical Research Letters estimates that northern permafrost-bearing soils are the largest reservoir of mercury on the planet, containing nearly twice as much of the heavy metal as all other soils, the oceans, and the atmosphere combined. Mercury, as you’re probably aware, is toxic, dangerous stuff that can interfere with pretty much every organ in the human body, sometimes causing brain damage and even death. If there’s loads of it locked away in frozen earth, we probably don’t want it escaping. Permafrost is, as its name implies, permanently frozen-soil, built up over millennia as bits of dead plant and animal matter accumulate and become buried in some of the coldest regions on Earth. Permafrost is best known for storing billions of tons of carbon, but it can lock away other elements, too. Like mercury, which lands on the soil’s surface from the atmosphere before becoming chemically bound to organic matter, and eventually, frozen. Scientists have been aware that soils can accumulate mercury for a while, but according to Schuster, nobody had systemically tried to estimate the amount naturally-occurring mercury locked in permafrost. His new study, which included collaborators at roughly a dozen institutions and was partially funded by both NOAA and NASA, is a first stab at doing exactly that. The scientists picked 13 locations in Alaska along a north-south transect spanning about 500 km (310 miles) and representing a range of different permafrost types. At each site, they drilled cores down to about a meter’s depth and analyzed the carbon and mercury content in the frozen soil. Extrapolating these numbers out based on maps of the carbon contained in soils around the globe, the researchers arrived at an estimated 793 gigagrams of mercury (that’s more than 15 million gallons, according to a news release) trapped in northern permafrost. What’s more, the authors estimate that the total mercury trapped in permafrost regions—in both frozen and non-frozen soils—is 1,656 gigagrams, making these regions the largest such reservoir on Earth. There’s much more work to be done—the error bars on the authors’ estimates are pretty big, which isn’t surprising given they were attempting to estimate a global number based on measurements from 13 different sites in Alaska. To reduce that uncertainty, they need a lot more samples from different parts of the world. Schuster said a follow-up study with samples from Siberia, Scandinavia, and Canada is already underway. The other next step is figuring out how much mercury is actually released, into both atmosphere and local waterways, as permafrost thaws—which it is most definitely doing. In thawed soils and water, certain microorganisms will transform elemental mercury into methyl mercury, a potent neurotoxin that can bio-accumulate up the food chain. Fish higher up on the food chain, like king mackerel and swordfish, already contain high levels of mercury, which is why the FDA recommends pregnant women and young children avoid them. As Schuster pointed out, additional mercury release from permafrost soils could pose a serious problem for subsistence communities, including Alaskan Natives, who get most of their calories through hunting, fishing, and foraging. He says he’s been approached by elders from Native villages about mercury in fish, and that he takes their concerns very seriously. “Mercury is already an issue in the food supply [of people living in the Arctic], because it accumulates in the meat of certain fish that people depend on for food,” and in mushrooms that people like to gather, Griffith said. There are still a lot of unknowns, but if this paper is any indication, mercury in permafrost is an issue that deserves more attention. Griffith noted that based on the new study’s estimates, if even a small fraction of the mercury locked away in permafrost were to thaw, “that’s on order with what humans have mobilized and put into the environment” via industrial activity. Why Is Greenland&apos;s Ice Sheet Covered in Industrial Waste-Chowing Bacteria?